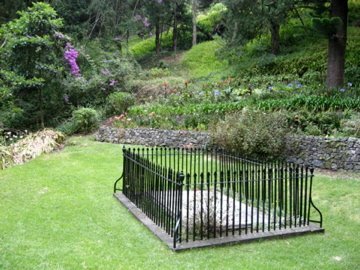 During Napoleon's exile on St. Helena the Longwood House was his residence. It is located on a windy plain about 6 km from the capital Jamestown. 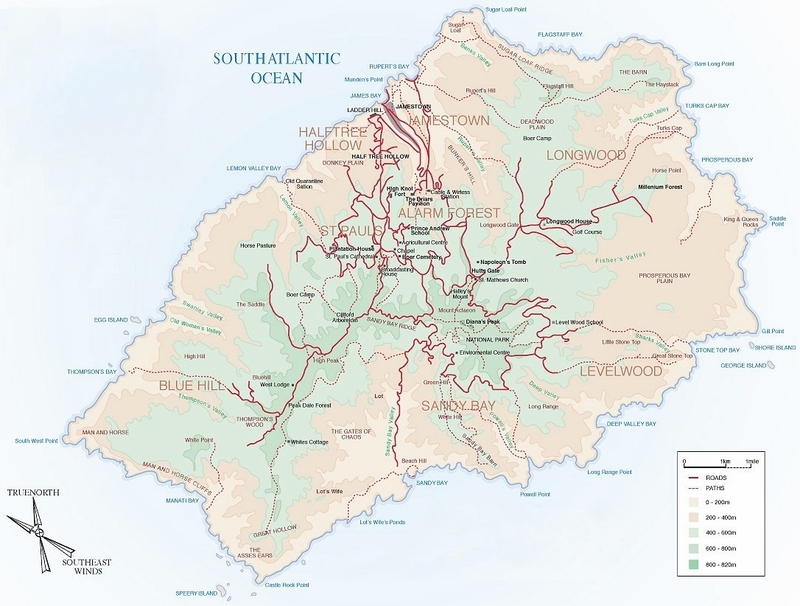 Map of St. Helena (click to open large version) with in the center Diana's Peak. 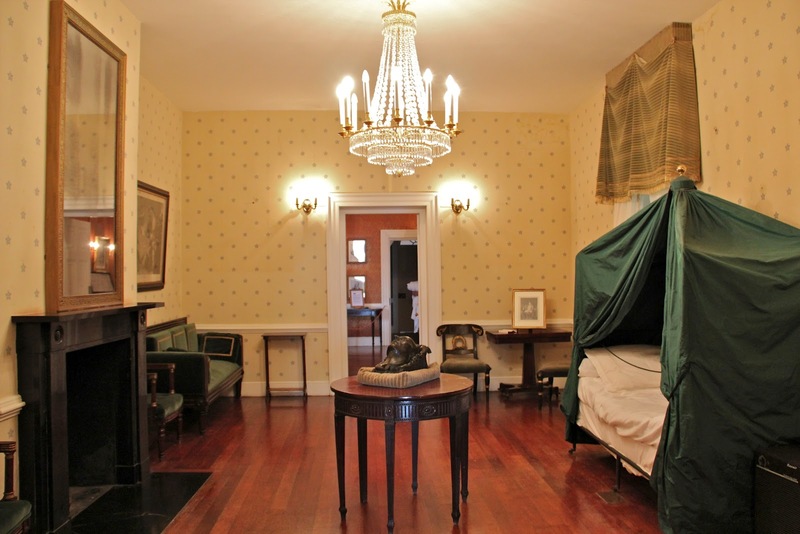 If you start there following the red road towards Longwood you first pass by Napoleons tomb, and then you arrive at Longwood House. On May 5th 1821 Napoleon died. Longwood House's Reception Room where Napoleon died (photo by Margaret Rodenberg). He was buried in the nearby Valley of the Geraniums. He himself had selected this beautiful location, although his first choice was to be laid to rest in Paris (in 1840 his remains were indeed transfered to Paris). Since 1858, after reports of neglect reached Napoleon III, the Valley and Longwood House are in possession of and maintained by France under the name of 'French Domains of Saint-Helena'. 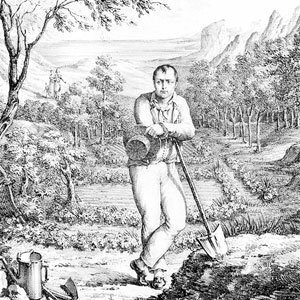 Napoleon had taken up gardening at St. Helena. Somehow I never envisaged Napoleon as a gardener - but it does show anothre side to the man. It is curious how this villain (Napoleone) did bring all Europe to wars and fires down 20 years, but he is described by the books somehow as a hero. The English had been very kind to give him water and food in this island from 1815 up to 1821. No other strategist has had the charm and genius of Napoleon. He was an intelligent, progressive man who changed the history of Europe and has put the foundations of democracy in France. No British politician is now worthy to clean his shoes. I would rather tend such a garden than rule France. An egocentric who would not accept any point of view but his own. Either you believed in him or you couldn’t stand him. In addition to a bold military strategist, the status that gave him the vehicle to impose his will; he was a man of culture and science.